On the Co-Optional Podcast, the panelists discuss various game releases for the upcoming week. 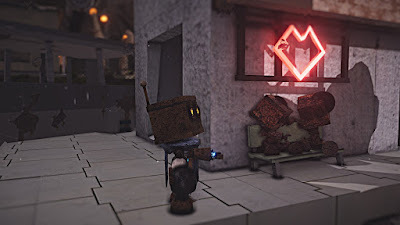 Occasionally the three will show interesting games to look forward to, and that is the case with Mechanism, an indie puzzle/horror game created by one man. 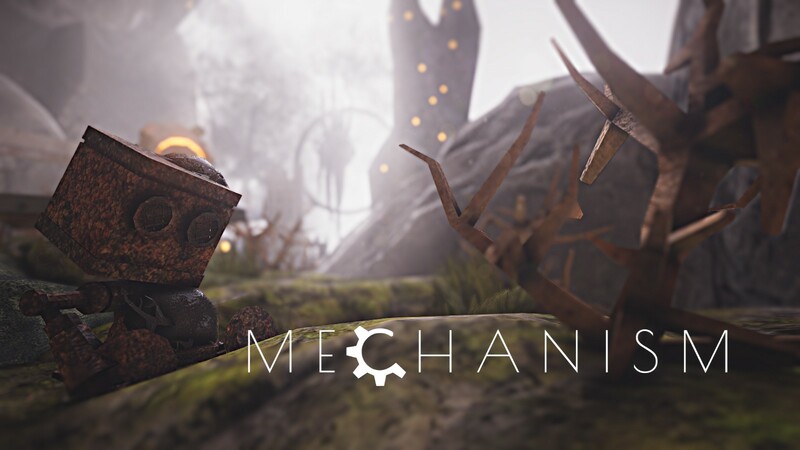 Mechanism is a steampunk game with a robot protagonist reminiscent of robots in the movies Short Circuit and Wall-E. It is set in a dystopian future. Alexander Goodwin had released another solo project titled Algotica Interation – an educational game about programming. Please note: This man has done everything for Mechanism, meaning there are some issues with the game that might be fixed by the time this review launches. If that is the case, we will add in an update to notify that the issues have been solved. The main thrust of the story behind Mechanism is to figure out what is going on. It's a puzzle game which requires exploration and observation. Right from the intro screen, players get a sense of the developer because there are bits of familiar coding scattered throughout the game. That piece of coding is hexadecimal and it says "follow the symbol". Clearly, this is a clue. 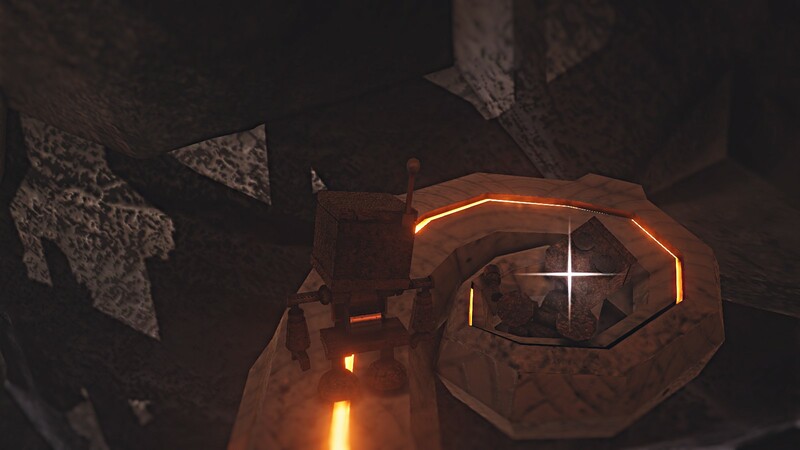 Upon starting the game, when the robot turns on, its eyes flash and the first thing most players will do is turn off the alarm. Highly perceptive players will notice that the alarm clock also has hexadecimal code on its front panel. It says "awake". As a short aside, upon further digging, Alexander Goodwin's Steam icon is the pictorial version of the Fibonacci sequence. (For those that don't know what the Fibonacci sequence is, here is an explanation) Suffice it to say that not only is the developer a programmer, level designer, audio designer, etc..., it's fair to deduce that he enjoys codes in general. Once the robot wakes up, exploration is the most important task because the key is discovering why this "Phlegm" infects everything. Players are stuck in a world that is littered with dead robots. Since there aren't other living creatures that can explain what has happened in this world, the only clues come from the environment and bits of dialogue from snails. 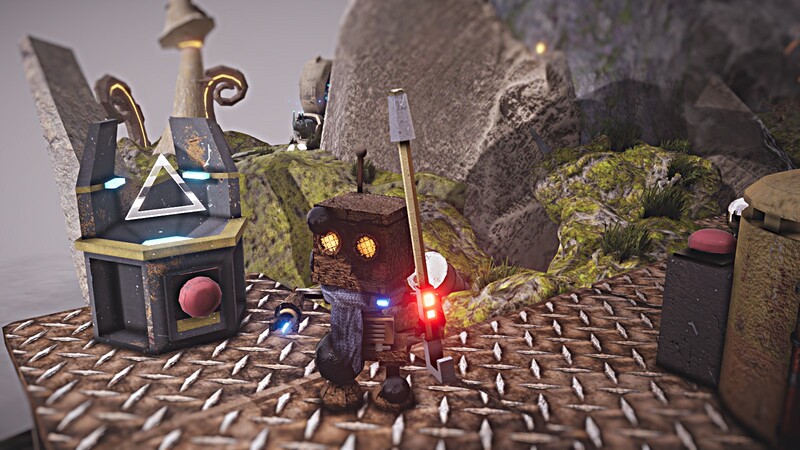 These things serve as the game's hint mechanic. Unlike most puzzle games that rely on players deducing solutions, the puzzles in Mechanism have more to do with item locations. Puzzles are solved once all pieces are attached. 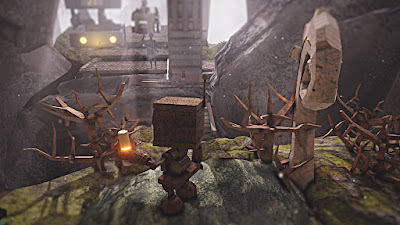 Mechanism is a game that has both mechanical and natural elements and it successfully merges the two into a fantastic dystopian world full of interesting puzzles. The darkness adds to the mild horror aspect of this puzzle game, in that there is some minor jump scares. There is a creepy human that disappears on approach too. Once in a while, players encounter amorphous oily creatures that appear from the walls or from behind posts. These creatures consist of the same substance as the Phlegm that plagues the world. In fact, when the robot becomes infected with it, blobs of this oily substance visually appears on its body. The graphical representation of the items needed for a mechanism to work is a great way to help players move forward without holding their hand. As such, Mechanism is less about guesswork and more about story understanding and exploration. So far, there is one creative item that amuses me greatly, and that is the umbrella. There's something oddly entertaining about a Number 5 style of robot carrying around a digital umbrella. In short, the graphics for Mechanism is fantastic. Every bit of space used tells the story of what happened in this world. Unlike other puzzle games, for the most part, the puzzles in this are not difficult to solve. It's easy to see what needs doing in each section. 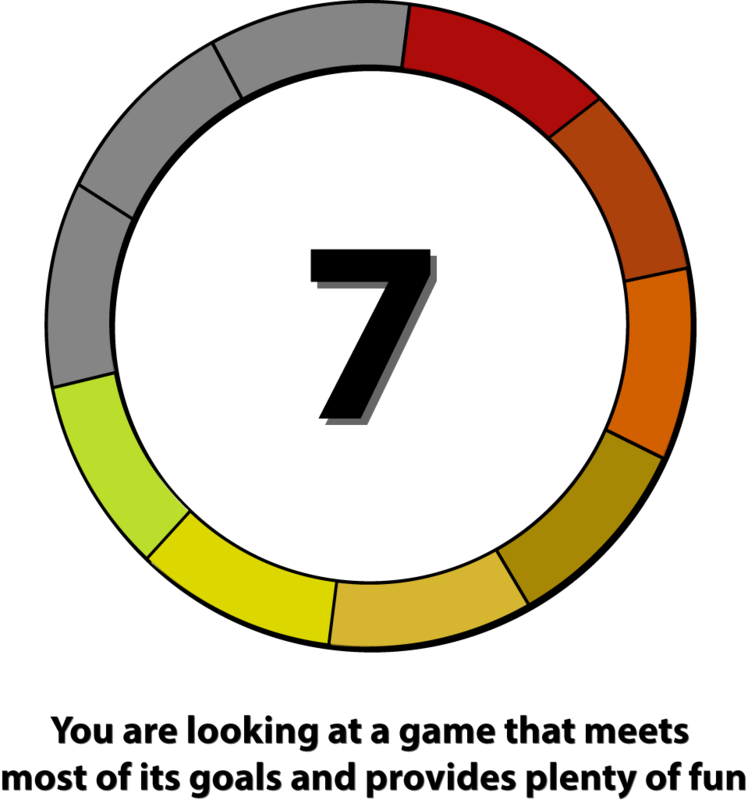 What makes the game challenging is being observant enough to find the objects while avoiding the phlegm. In fact, if the robot is infected with the phlegm, objects will drop out of its hands because of the robot trembles. In a hilarious moment during game play, I was looking over at another area and accidentally dropped something down the side of the world! Never fear because the developer thought of this! In other puzzle games, players get a number of chances to solve a problem. When players are unsuccessful, puzzles will automatically reset. Mechanism has a different reset concept where players must go up to a device that resets everything not already in its proper place. As in, if a puzzle is partly assembled or it is complete, none of those items will reset. This only applies to dropped objects in different areas of the map. It is both good and bad depending on how much backtracking a player has to do. Now, make no mistake, like in the Myst series, Mechanism requires a good amount of observational skills. There were moments that I did not see certain things until I had a different vantage point. Also like the Myst series, there are paths that aren't readily obvious. As such, players have to move an object to see other paths. I know that on more than one occasion I simply had to turn around to find another path. Therefore, the puzzle element of this game has more to do with strategizing than brain busting panels that require multiple pieces to figure out – hence, the puzzles are easier. Considering that Alexander Goodwin developed this entire game on his own, the music in Mechanism is fantastic. In fact, I would love to have more of it in the game. Oddly, the menu screen has a very sombre and intriguing song that I've become addicted to. The piece is relaxing and evokes a sense of wonder. Honestly, the music in Mechanism is brilliant and as a musician, I'm having a difficult time understanding what draws me to that particular piece. In the game, music begins at trigger points. For example, the first trigger is right outside the beginning hut. Now, when it comes to Mechanism being a horroresque type of game, the music and sometimes the lack of music in areas adds to the uncertain atmosphere. It combined with the blaring tuba style horn is enough to throw players into that unnerving place. Overall, the music and sounds created by Mr. Goodwin is brilliant. Considering that the menu screen music is both euphoric and soothing, the rest of the soundtrack feels like the opposite. 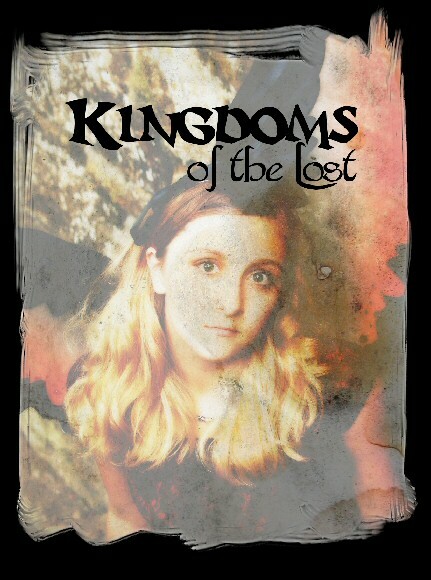 It captures players right off the bat, easing them into a false sense of security then adds to the creepiness and fear of the unknown world before them. In other words, the music is well designed. Super simplistic options menu with no ability to change brightness. It has no FOV sliders and players don't get to zoom in closer either. Every time the game is exited, it resets to the lowest resolution possible. Visual collusion made it difficult to assess the environment. Interaction with objects often has a few seconds of delay. Sometimes objects need to be interacted with a second time to work. Despite the game's flaws, most of my issues with the game are fixable and don't inhibit the game play. Mechanism has an excellent foundation. It has a unique and full story for puzzle players to immerse themselves in. I have a huge amount of respect for Mr. Goodwin's ability to create a compelling concept on his own. It looks amazing, has a cute protagonist, intrigues players, and has a fascinating premise. The music is brilliant and the simplicity of the game's vision is heartwarming. 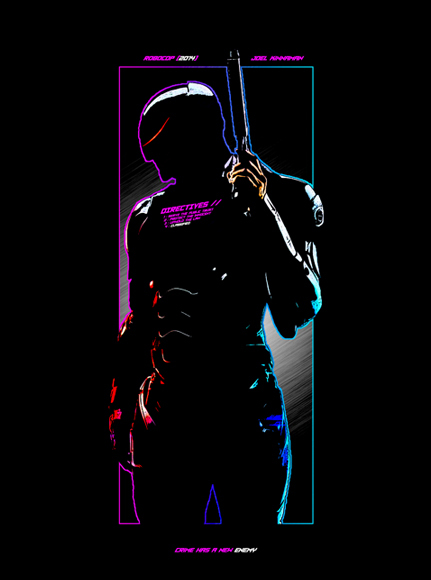 While no game is ever truly flawless, despite the issues I had on play through, I still love this game. As a result, I have high hopes for Alexander Goodwin's career. I can't wait to see what he can do with an amazing group of people should he choose to work with a team on a future project. Overall I give this game a seven out of ten. I love many things about Mechanism and understand that solo developing a game is extremely difficult. As such, I recommend this game to puzzle lovers even though it's not chalked full of extremely complex puzzles. Mechanism is available on Steam and it is less than $20 to purchase. 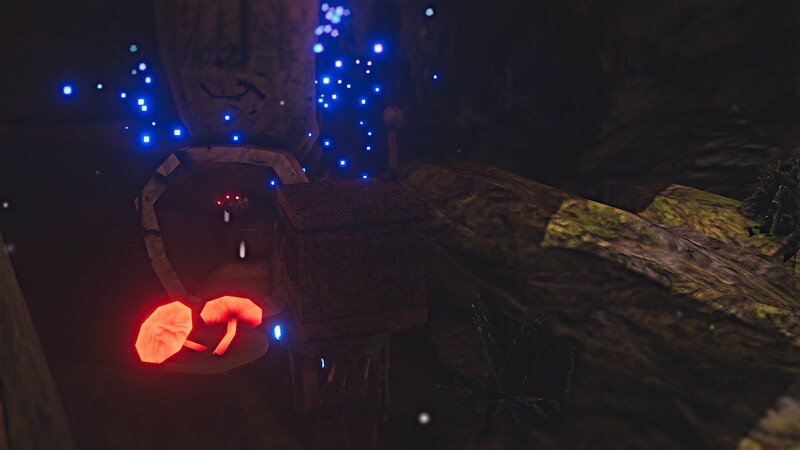 The developer, Alexander Goodwin releases regular updates to the game. Make sure to follow him for future updates and works on Twitter.